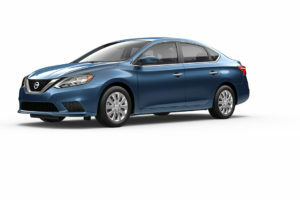 The 2018 Nissan Sentra continues to up its style, sophistication, and refinement with every new installment, pushing the boundaries with best-in-class combined fuel economy and an array of attractive standard features that provide the look and feel of a luxury car, all for a price that you wouldn’t believe. The new Sentra also comes loaded with a ton of standard safety features, making it a potent combination of performance, economy, and safety. Visit Vernon Nissan to find a great selection of Nissan Sentra models for sale in Vernon, BC. Choose from all of the Nissan Sentra sedan trim levels including the Sentra S and Sentra SV, as well as additional luxury and premium packages including the SR and the top-of-the-line Nismo. We also have a comprehensive used Nissan Sentra selection with 2017 and 2016 Sentra models on the lot. Drop by for a test drive today! The 2018 Sentra achieves remarkable fuel economy at 6.8L/100km on the highway and a sharp city equivalent of 8.9L/100km giving it an impressive real-world driving range. This is thanks to an efficient 1.6L turbocharged engine paired with a next-generation CVT transmission, which delivers smooth power at all speeds. Intelligent Key Entry and Push Button Ignition make it easy to get in and go. The Sentra’s sleek design was refined in the wind tunnel to provide a quiet ride that maximizes efficiency without sacrificing beauty in design. Compared to the previous generation, the 2018 Sentra cars share a 15mm longer wheelbase for enhanced driving dynamics. The Sentra SR Package adds striking 17-inch alloy wheels and an aggressive front and rear fascia for a defined presence on the road. The Nissan Sentra Coupe gives you a sports car look while the Sentra Sedan gives you optimal versatility and comfort. High quality interior materials give you the feeling of sitting in a much more expensive car, and a careful attention to detail is evident throughout the cabin. You can savour every moment on the road with an upgraded BOSE premium audio system, while Dual Zone Climate Control will keep you and your passenger comfortable. NissanConnect now comes standard, as well as features like Automatic Emergency Braking, Intelligent Cruise Control, and a 5-inch Driver Assist Display. The interior is designed for versatility with available Divide-N-Hide® Adjustable Floor that offers a hidden cargo area to stow valuables. Standard 60/40 split rear seats make moving furniture or storing luggage a breeze, while new optional heated seats bring warmth to the coldest Canadian winter. Drop by Vernon Nissan’s parts department for fresh Nissan Sentra accessories and replacement parts. We have a great selection in stock, and if we don’t have what you’re looking for we can bring it in right away. For your convenience you can easily order your parts online. You can also drop by our repair shop for comprehensive service and mechanic repair as well as parts installations.